Six young people have been given an incredible opportunity to improve their prospects, overcome the barriers to employment and become more independent. A £10,500 project jointly funded by Spectrum Housing Group and the Hampshire and Isle of Wight Community Foundation (HIWCF) enabled the young people from Spectrum Housing Group’s Foyer in Ryde to undertake one of our engagement programmes. Unlocking Potential has previously been for young offenders and had a 91% success rate (those not re-offending after completing the course) but the four-week course has now been undertaken by individuals from within the local community who were identified as requiring additional support. The Foyer has worked with UKSA on a number of occasions in the past, including on The Prince’s Trust Team programme, which achieved some very positive outcomes. It was decided to try the Unlocking Potential course. A selection day was held and 14 residents took part, with six being selected for the full programme. All the activities are aimed at developing team work, independence, confidence and self-esteem. The first week is spent on-site at UKSA, where on a residential the team bond and take part in a week of watersports and team building exercises, then the second week is spent out on a yacht for a sail phase. There is already a sense of achievement when they enter their third week, a community development activity to help them make a difference. 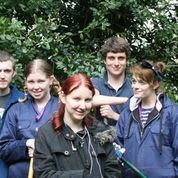 This group spent the week cutting back an overgrown area at Church Lodge, Northwood House, to enable easier access for future renovation work. Finally, they returned to the now-familiar UKSA on a week of work experience, building their knowledge and understanding of the workplace, and helping the charity in departments such as maintenance and the busy kitchen. The focus this week was also on outcomes and moving forward, looking at suitable destinations for a better future. UKSA’s chief executive Richard Thornton said: “This course has been very successful previously, using on-the-water activities as the catalyst for positive change. Participants build confidence and self-esteem, overcome challenges by working as a team and experience the structure of a busy working day. David Holder, 19, has been living at The Foyer for six months and said he wanted to do the course as soon as he first heard about it. “It sounded just my sort of thing,” he said. He had done some dinghy sailing in the Army Cadets and had missed it and was keen to get back into it. He loved the whole experience and although he has wide and varied interests he is keen to get a job working at an activity/adventure centre. Mark will spend his final week doing work experience at UKSA, in boat maintenance, which is an industry he might be interested in working within, as he is keen on construction and building but hadn’t considered maritime before.